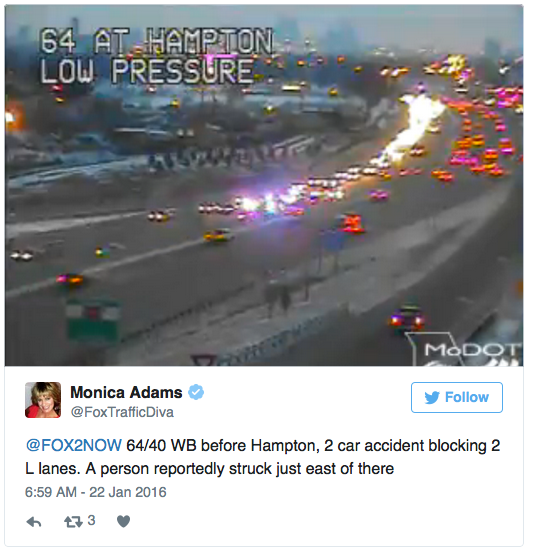 ST. LOUIS, MO (KTVI)- Police are investigating after a pedestrian was struck and killed Friday morning on westbound I-64/40 before Hampton Avenue. All westbound lanes of the highway were shut down for close to four hours following the accident. Police say the man was walking in the fast lane when he was hit. Jerry Wiggins, 53, has been identified as victim of the fatal crash. Police say a driver tried to swerve to avoid hitting Wiggins, but was unsuccessful. He was pronounced deceased on the scene.